‘Where do we go and where do we find a safe haven?’ one asks. Ahmad, a 25-year-old activist in Raqqa, awoke at 4 a.m. on Tuesday to the sounds of explosions. The sounds were different than the usual strikes carried out by Syrian government aircraft. Later, he learned that what he’d heard were the first strikes by an international coalition led by the U.S. and backed by five Arab nations. They had begun airstrikes against the Islamic State of Iraq and Syria (ISIS) in four Syrian provinces. In Raqqa, the Sunni militant group’s eastern stronghold, raids targeted key ISIS buildings and checkpoints. The Syrian Observatory for Human Rights, a Western-backed opposition group, said up to 70 civilians had been killed. In the days after the initial strikes, which led families to flee for rural areas of the province or the Turkish border, residents and activists in Raqqa described a state of fear and panic. They say many shops have temporarily closed, most people are restricting their movements around the city, and ISIS fighters have been preventing civilians from approaching areas that have been bombed by the Obama-led coalition. 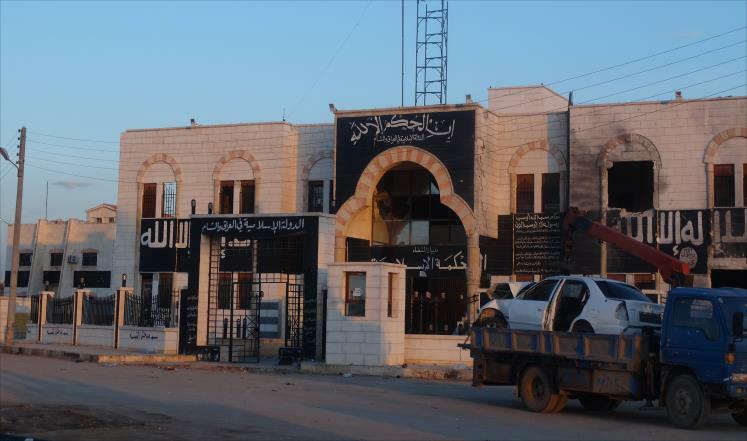 Youssef heard of more than 20 strikes in Raqqa in the early hours of Tuesday morning, with seven hits on the provincial capital, one of ISIS’s most important local buildings, and others on the Makas checkpoint at the city’s southern entrance and a large rural training camp. Strikes also hit the military airport south of the city, a former regime stronghold that has been under ISIS control since last month and the installations area near the city’s Forat dam. Another Raqqa resident, Abu Mazen, 41, fled with his family to a relative’s house in a rural village after the strikes began. He fears that the new round of strikes will lead to a large number of civilian casualties. “I do not support the airstrikes, but I do not support ISIS either,” he says. Fatima Said, a 35-year-old teacher in Raqqa, says that in just two days there has already been a sizable displacement of people fleeing the city.